To say Hannah Monty broke into the quidditch world this summer would be incorrect. But she undoubtedly burst onto the American scene in a big way. And while her rise to prominence on the American stage may have surprised some, for Australians that have watched her for years, the performance was no coincidence. 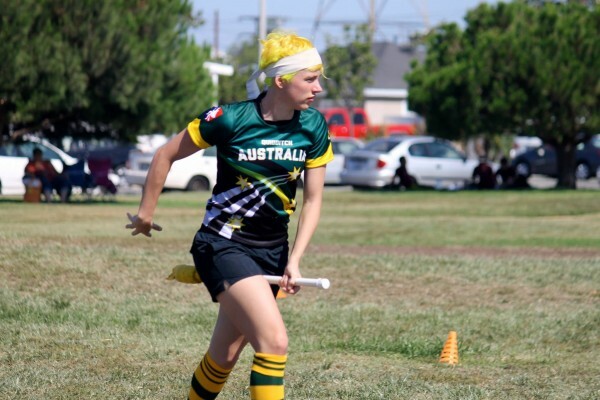 Monty started her quidditch career with the University of West Sydney (UWS) Thestrals at the end of 2011, participating in the Australian national tournament, QUAFL Cup. The Thestrals placed second, losing to the University of New South Wales Snapes on a Plane in the final. Quickly rising to prominence, Monty began the 2012 season as coach and captain of UWS. Bringing her background in ultimate frisbee, netball, soccer, basketball and Australian rules football, Monty is a threat on and off the ball, with her skill overcoming her lack of physical size. With her skill and athleticism, she is a difficult mark for male and female opposition alike. Monty’s first step toward international fame was her placement on the Global Games Australian selection committee. Being selected for said squad was the second. As starting female chaser for the Drop Bears, she needed to impress if she hoped to make a name for her country in the sport, and she did so in a big way. Going into West Fantasy, many questioned whether the Australian team could compete with the Americans in regards to physicality, and Monty answered them all definitively in the affirmative. She was prolific on offensive, racking up goals and regularly bringing down players much bigger than her. She even produced a highlight reel moment, outrunning the Lost Boys’ Jeff Lin on a breakaway. Her speed gave her a huge advantage over the other female chasers in the tournament, allowing her to run circles around players twice her size. But more than anything, her positioning around the hoop area and her awareness on the ball were her key qualities. Being able to get to the ball quickly and turn dead plays into points made her an extremely valuable and scrappy asset. Her great play continued at Global Games, where she was one of the lead point scorers for the Drop Bears. Her physicality and speed, especially against less-experienced countries, created matchup nightmares for the opposition, and her overall performance proved that West Fantasy was no fluke. As displayed during her trip through North America, Monty is a true competitor. There is no challenge she will back down from, and that makes her a scary competitor on the pitch. Any loose ball she sees as hers for the taking. She is the type of player that will take advantage of every mistake and force you to make them. It seems the next step for Monty at this point is to lead UWS to a national Australian championship, a championship they have never actually held. With her skill, talent and leadership, there is no question that the Thestrals are going to be a dangerous team all season long.